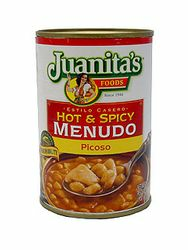 Juanita’s Menudo is the NUMBER ONE selling Menudo in the United States. It is considered a staple in the Mexican food category. And no wonder, with it’s authentic homemade taste that can be enjoyed in minutes, rather than the many hours it requires to prepare in the home. Juanita’s only uses U.S.D.A. approved beef tripe. We only use salt and lime to process the dried white corn into savory hominy never using lye like other brands. All you need to do is heat and serve Juanita’s Menudo and garnish with diced raw onions, fresh sprigs of cilantro, a squirt of fresh lime, and sprinkle with dried aromatic oregano. Menudo picante de la marca Juanita's preparado con tripa, maíz blanco, cebolla, chile y especias. Have ordered before many times. The best! ProsSpeedy shipping, Packed especially well! Living in Massachusetts, I miss the flavors of real traditional Mexican food. 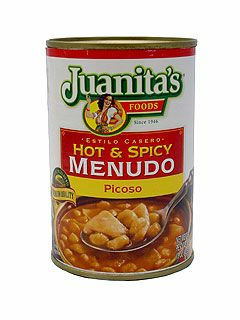 I keep cans of Juanita's menudo so that I can get my fix once in a while.